Simply plug the PowerOUT! into any 120V outlet or power strip. When the power fails, the PowerOUT! emits a pulsing alarm, about as loud as a travel alarm clock. At the Same time, the PowerOUT! illuminates three built-in, ultra-bright LEDs to provide safety lighting. The PowerOUT! 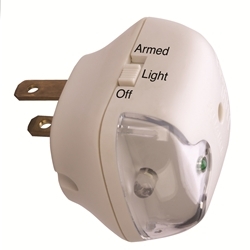 can be removed from the outlet and the three-position switch set to "LIGHT" position, silencing the alarm, and the ultra-bright LEDs will provide up to six hours of portable lighting. NOTE: NOT TO BE USED FOR MEDICAL PURPOSES!! THIS PRODUCT SHOULD NOT BE USED BY THOSE WITH HEARING DIFFICULTIES!! Sounds an audible alarm in a power outage (volume is similar to a travel alarm clock).